The Metadata Editor for Excel (Excel File Properties Changer) is an application allowing to quickly view and change multiple Excel document file properties such as summary information, date stamps, file attributes and statistics. The Metadata Editor for Excel is useful to harmonize Excel document metadata within an organization for purposes such as search optimization. View and change all summary information metadata including Title, Subject, Author, Keywords, Comments, Catagory, Source, Revision Number, Last Saved By, Manager, Company, Created Time/Date, Last Saved Time/Date, Last Accessed Time/Date, Total Editing Time and Last Printed. View and change all file attributes including Read-only, Archived, Hidden and Not in Content Index. 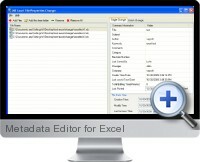 Microsoft Excel is not required to be installed to run the Metadata Editor. Supports all versions of Excel file formats from 97 to 2010. Change Excel file properties in single file or batch mode. Export the file property metadata as a CSV file which can be opened and edited in Excel.